Polycarbonate Plastic and Stainless Steel foraging toy for your larger sized feathered companions! You can use the Stainless Steel rod as a skewer (as shown in photos) for adding wooden parts, bagels, carrots or other goodies to add to the fun! Quick link on top for easy hanging! 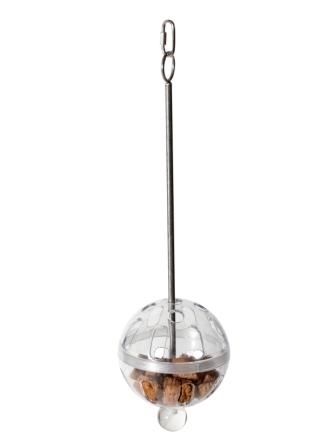 This toy was designed for the more destructive beaks in your house ... based on a very sturdy stainless steel skewer and a 5 inch foraging ball. Also, check out the Capsule, Wheel, Generation II Wheels, Carousel, Push & Pull, Paddle Wheel, and See Saw foragers! The Foraging Ball and Kabob arrives empty and ready for you to fill with your parrots favorite goodies. Offer only dry, healthy treat foods in these feeders, empty them often to avoid spoilage! You can wash all acrylics in one part bleach, 3-4 parts water, rinse thoroughly and air dry!